What is the Loupe Collage Widget? What is the Loupe Picker Widget? How do I submit feedback to improve the tool? 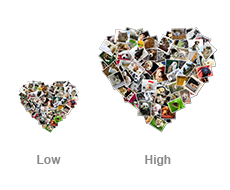 The Loupe Collage Widget allows you to open our collage tool from within your webpage. 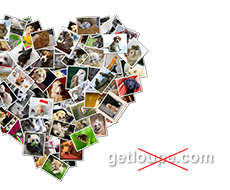 The tool will allow users to quickly create a collage. Once completed, the tool returns to your website with the resulting image as a URL. The Loupe Picker Widget allows you to open our photo picker tool from within your webpage. This tool gives users the ability to upload or select from a set of their photos. Once the user is finished, the resulting list of images is returned to your website. You are charged whenever a collage is rendered and we only render collages at the size that you request. The typical flow for a webpage using our widget is that users will create a collage and you will only request the low resolution size. Then, when the customer has actually purchased a product, you can request whatever resolution is appropriate for that product. This way, you would pay the low cost of the thumbnail previews and the higher cost for the high resolution image when the user is making a purchase. Tiers are the upper limits of the width and height of the collage in pixels. The price for generating a single collage under the different tiers are specified in the table below (valid values of tier can be found in the same table). Watermark collages are those which use the default watermark on the collages. No Watermark collages include custom watermarks, no watermarks, and PSD files. We'd like to hear your feedback, feature requests, and/or any changes you would like to see implemented in our widgets. Please contact us!